When I visited India few months ago I realized Indian ethnic trends took a long time to reach USA. I felt as if my entire ethnic collection was outdated except the ones sent to me by my blog clients. I then felt the need to be connected with Latest Indian ethnic fashion to know what is in trend. I didn't want to wait for months to get updates on these trends and by the time i know, its out of trend already. I am a avid smartphone user, feel helpless without it. I looked for mobile applications online which can keep me updated on the latest ethnic fashion trends. There are tons of fashion applications but for ethnic fashion not many. Thats when I discovered Ethnic Fashion - A fun app for the Desi Gal. Fortunately this app mainly caters to ethnic fashion so I don't spend time browsing through endless western outfits while I am looking for Indian trends. Since its an invite only application I am assured that all profiles are mostly real and real women share their pictures, with whose body type I relate to. We all have our share of expensive ethnic clothing that we fondly buy during festive season, weddings or special occasions. Most of these outfits get worn only once or wait for years to be worn again, if we could still fit in, that is. So what do we do with all these gently, rarely used outfits?? Now Ethnic Thread provides us with two choices, Rent or Sell. Yes you could offer your best designer Indian outfits which others would love to wear for Rent or if you wish to make some space for new ones, just sell it. 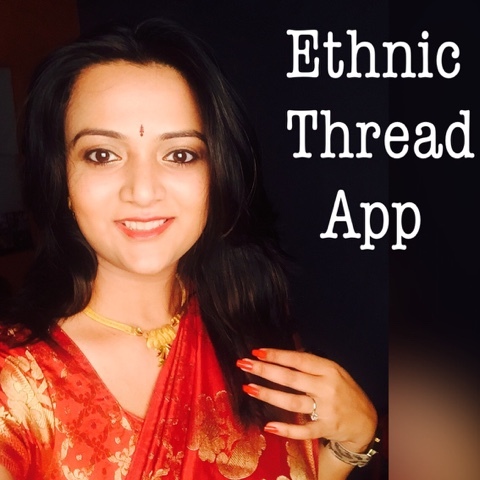 Ethnic Thread App which is available for iPhones and Androids is a Simple and easy to use app. You can list your item to sell or rent in minutes, review responses from other fellow users. You can also share pictures to showcase your style and fashion. This application also provides you various filters which makes your shopping search easier. I have been using this app from few months now. I love the fact that now I can be updated with latest ethnic trends around the world. I also feel inspired with the variety of designs and collections. I have put my favorite Saree out there for sale as well. Ethnic Thread App also has a list of services like Make up, Salon and Fitness to name a few, you can easily search for these services in a location near you. Read reviews before availing these services. I personally spoke to Sailee Raje, The founder and she made it very clear that she aims to build an community not just a mere buy and sell platform. Her actions totally justify that vision. I have seen so many Ethnic Thread meet-ups held in various cities in India. I hope one happens soon in Seattle as well, it could happen in your home town so do spread the word. Click here if you wish to get invited to this community Ethnic Thread. Thanks for writing and sharing this Ananya !. I can very well relate to this and good to see innovation in this space through mobile apps.I'll try it out. wow nice post ananya!! I really like your post. You have bank of brain. Your writing style is very nice. oh wow this sounds interesting to me!